A teacher is speaking out after seeing students getting dripped on by leaking pipes at a Baltimore City elementary school. BALTIMORE — A teacher is speaking out after seeing students getting dripped on by leaking pipes at a Baltimore City elementary school. Aaron Maybin, a former NFL linebacker, is now a teacher at Matthew A. Henson Elementary School and is not afraid to voice his opinions about the school system on Twitter. Last year he tweeted a picture that went viral showing his students wearing winter coats in the classroom because there was no heat. On Thursday, he was tweeting about more issues at the same school, but this time he tweeted a video of pipes leaking on a student. The school sent out a statement later in day saying a leak was discovered in the hallway ceiling due to aging plumbing infrastructure. They say it is not a result of changing temperature or heating issues. They continued to say that school staff has removed the ceiling tiles, positioned a large trash container to capture the water, and cleaned the area. They are also monitoring the leak to ensure safety for students and staff in the hallway. According to their statement, the leak has been contained, does not pose a health threat or safety concerns, and will be fixed Thursday afternoon after school dismisses and the water can be turned off. The statement was sent by Baltimore City Schools about four hours after Maybin had posted on Twitter, a move he said he wishes he didn't have to make. "It's just leaking onto lockers, onto the floor and it's just an unsafe environment. 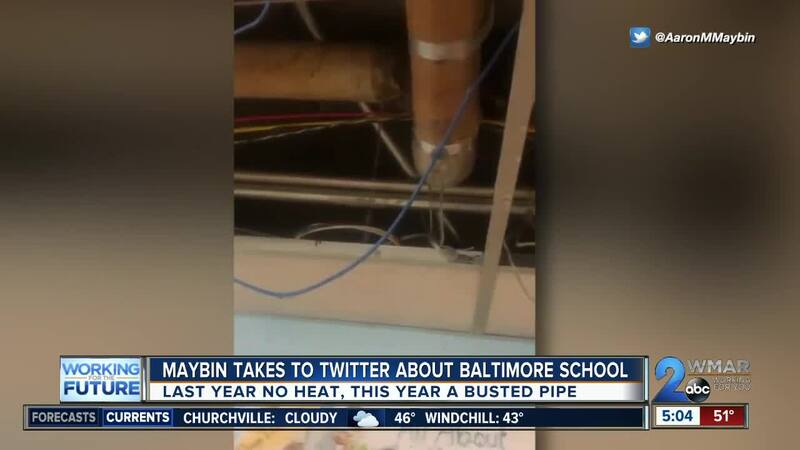 So at that point we hadn't had anyone from the city respond to our calls or try to fix the problem, and kids were coming into the building , so you got to go to Twitter unfortunately when policy makers aren't stepping up," Maybin said in an interview with WMAR-2 News. And when reporter Brian Keubler asked him about his tweet last year and heating issues in the school, he said they are still prevalent. "We are still dealing with a lot of that kind of stuff, you see the community that we are in, you know the kind of economic issues that a lot of us are dealing with, so that goes along with the territory unfortunately. Just doing the best with what we have," explained Maybin. As of Thursday afternoon, Baltimore City School officials say the leaking pipe is repaired and a contractor checked the building.